* 2017 Update: For the main BEL page on Islamic extremism see kgov.com/terror. * Yesterday U.S. Navy Seals Killed Osama bin Laden: Today Bob Enyart talks about the principles of justice that show that killing him was morally justified. And we talk about conservatives who hopelessly try to determine whether various actions are right or wrong by looking to see what the U.S. Constitution might have to say about the matter. Also, we talk about the non-virgins who Osama may have met moments after his death, including Adolph Hitler, Yasser Arafat, and Mohammad himself. * 10 Years Ago Hundreds of Millions of Muslims Supported Osama bin Laden: See the excerpts below from Daniel Pipes article from a decade ago in the New York Post. And Pipes decade-old evidence is reinforced by today's quote from the head of Hamas in the Gaza Strip, who told reporters, "We condemn the assassination and the killing of an Arab holy warrior. We ask God to offer him mercy with the true believers..."
Today’s Resource: Have you seen the DVD that has brought more people to salvation than any other BEL resource in 20 years? It's Mount Moriah: Evidence for the Resurrection! You might want to see this to help strengthen your ability to share the resurrection of Jesus Christ with friends and relatives. And if you are a non-Christian listener to BEL, you are invited to call in and ask for a copy of Mount Moriah and we'll mail it to you free of charge as a gift. For the rest of you, hey, you'll enjoy this DVD and you'll help Bob stay on the air and reach more people by purchasing a copy or two (one for a friend)! And you may also want to watch Bob's DVD Defending the Faith: Apologetics with Dave Spiegel. And monthly, you can enjoy one or two of Bob’s insightful videos, mailed to you automatically, simply by subscribing to the BEL Monthly Topical Videos service! And you can check out the other great BEL subscription services! ... Karen Armstrong, author of a bestselling book about Islam, reports that the "vast majority of Muslims . . . are horrified by the atrocity of Sept. 11." "It'd be nice if some leaders came out and said that the idea the United States is targeting Islam is absurd," notes one U.S. diplomat. They don't because the Muslim world is bursting with adulation for the Saudi militant. * "Long live bin Laden" shout 5,000 demonstrators in the southern Philippines. * In Pakistan, bin Laden's face sells merchandise and massive street rallies have left two persons dead. Ten thousand march in the capitals of Bangladesh and Indonesia. * Pro-bin Laden demonstrations took place even in Mecca, where overt political activism is unheard of. A Bir Zeit poll found that 26 percent of Palestinians consider the Sept. 11 attacks consistent with Islamic law. In Pakistan, a Gallup found a nearly identical 24 percent reaching this conclusion. Even those who consider the attacks an act of terrorism (64 percent of both Palestinians and Pakistanis) show respect for these as acts of political defiance and technical prowess. "Of course we're upset that so many died in New York. But at the same time, we're in awe of what happened," said a young Cairene woman. 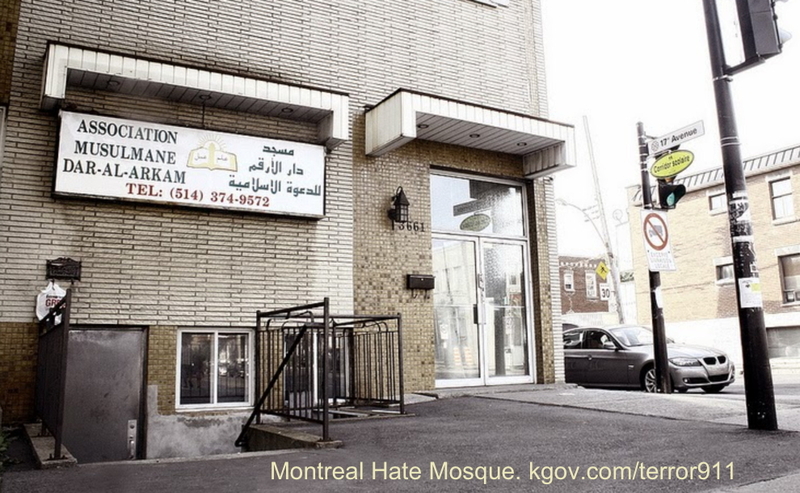 * 2017 Update from a Montreal Mosque: According to the Canadian Broadcasting Corporation, an Imam with a reputation as an extremist was invited to speak at a Montreal Mosque. In his message at Dar Al-Arkam (aka Dar Al-Arqam) he quoted a traditional Muslim hadith calling for Jews to be killed. The Islamic verse he quoted in Arabic (which the mosque itself then uploaded to YouTube), says in English, "O Muslim, O servant of Allah, O Muslim, O servant of Allah, there is a Jew behind me, come and kill him." This generated the second hate-crime complaint to the Toronto police within forty days. Related Question: What does CBC stand for? Answer: Nothing. Absolutely nothing.